General anesthesia (GA) can cause abnormal lung fluid redistribution. Pulmonary circulation transvascular fluid fluxes (JVA) are attributed to changes in hydrostatic forces and erythrocyte volume (EV) regulation. Despite the very low hydraulic conductance of pulmonary microvasculature it is possible that GA may affect hydrostatic forces through changes in pulmonary vascular resistance (PVR), and EV through alteration of erythrocyte transmembrane ion fluxes (ionJVA). Furosemide (Fur) was also used because of its potential to affect pulmonary hydrostatic forces and ionJVA. A hypothesis was tested that JVA, with or without furosemide treatment, will not change with time during GA. Twenty dogs that underwent castration/ovariectomy were randomly assigned to Fur (n = 10) (4 mg/kg IV) or placebo treated group (Con, n = 10). Baseline arterial (BL) and mixed venous blood were sampled during GA just before treatment with Fur or placebo and then at 15, 30 and 45 min post-treatment. Cardiac output (Q) and pulmonary artery pressure (PAP) were measured. JVA and ionJVA were calculated from changes in plasma protein, hemoglobin, hematocrit, plasma and whole blood ions, and Q. Variables were analyzed using random intercept mixed model (P < 0.05). Data are expressed as means ± SE. Furosemide caused a significant volume depletion as evident from changes in plasma protein and hematocrit (P < 0.001). However; Q, PAP, and JVA were not affected by time or Fur, whereas erythrocyte fluid flux was affected by Fur (P = 0.03). Furosemide also affected erythrocyte transmembrane K+ and Cl−, and transvascular Cl− metabolism (P ≤ 0.05). No other erythrocyte transmembrane or transvascular ion fluxes were affected by time of GA or Fur. Our hypothesis was verified as JVA was not affected by GA or ion metabolism changes due to Fur treatment. Furosemide and 45 min of GA did not cause significant hydrostatic changes based on Q and PAP. Inhibition of Na+/K+/2Cl− cotransport caused by Fur treatment, which can alter EV regulation and JVA, was offset by the Jacobs Stewart cycle. The results of this study indicate that the Jacobs Stewart cycle/erythrocyte Cl− metabolism can also act as a safety factor for the stability of lung fluid redistribution preserving optimal diffusion distance across the blood gas barrier. Transvascular fluid fluxes in the pulmonary circulation (JVA) may influence the diffusion distance between the pulmonary capillary and the alveoli, and compromise or improve gas exchange when lungs function undergoes physiological (i.e., exercise) or pathological adaptations (inflammation) (Vengust et al., 2013; Apostolo et al., 2014). Transvascular fluid fluxes in the pulmonary circulation are traditionally attributed to changes in hydrostatic forces and perfused alveolar capillary surface area, which are determined by the rise in mean pulmonary artery pressure (PPA) (Coates et al., 1984; Sinha et al., 1996; Vengust et al., 2006a). Erythrocyte volume (EV) regulation has also been associated with JVA through transmembrane/transvascular ion redistribution (IonVA) and intracellular osmolality changes (Wickerts et al., 1992; Vengust et al., 2006a, 2013). General anesthesia (GA) is a critical event, with a potential to change pulmonary vascular resistance (PVR) (hydrostatic forces) through alterations in cardiac output (Q) and pulmonary blood flow (Fischer et al., 2003). It affects ventilation-perfusion (V/Q) matching, which triggers a variable degree of the hypoxic pulmonary vasoconstriction (HPV) to match regional ventilation and perfusion and to maintain oxygenation. HPV increases PVR; higher pressures at the microvascular level then lead to greater transmural hydrostatic driving gradients and increased JVA (Starling, 1896; Fischer et al., 2003). Transvascular fluid fluxes in healthy individuals at rest (steady state) are at or near zero (Coates et al., 1984; Newman et al., 1988; Schaffartzik et al., 1992; Wickerts et al., 1992; Vengust et al., 2006a, 2011, 2013). Several gravimetric studies identified an edemagenic PAP, which overcomes the hydraulic conductance of the lung microvasculature and the ability of pulmonary lymphatics to remove fluid from the lung parenchyma (Wickerts et al., 1992; Hoeper, 2009). Pulmonary microvasculature is very resilient to abnormal transvascular fluid redistribution (Schneeberger and Karnovsky, 1976; Bhattacharya, 1988; Maggiorini et al., 2001; Parker et al., 2006; Effros and Parker, 2009). However, JVA during GA may still progressively become abnormal at sub edemagenic levels of PAP (Chapman et al., 2005), and eventually compromise the diffusion distance across the blood gas barrier. The purpose of this study was to investigate IonVA and JVA during GA, which has not been investigated to date. Vengust et al. (2006a,b, 2011, 2013) in a series of investigations in exercising horses employed the method, which can detect in vivo changes in JVA, and even follow JVA changes with time after the application of different therapeutic agents. Furosemide was used in this study to evaluate pulmonary circulation adaptations to changes in hydrostatic forces and/or ion fluxes (Mukherjee et al., 1981; Narins and Chusid, 1986; Boles Ponto and Schoenwald, 1990). Furosemide is used to treat abnormal lung fluid redistribution (lung edema) mostly due to its diuretic effect, but also the possibility to alter transmembrane ion fluxes through attenuation of Na+/K+/2Cl− cotransport (Dikshit et al., 1973; Kracke and Dunham, 1987; O'Donnell, 1993). However, hydrostatic force increase and transvascular ion metabolism changes would have to be substantial to overcome the ability of pulmonary vasculature to keep pulmonary transvascular fluid dynamics at a steady state level (Schneeberger and Karnovsky, 1976; Bhattacharya, 1988; Maggiorini et al., 2001; Parker et al., 2006). Therefore, we tested the hypothesis that JVA, with or without furosemide treatment, will not change with time during GA. The study protocol was approved by the National Ethics Committee (document No. : U34401-23/2013/6), according to the relevant Slovene and European Union regulations. Twenty dogs (10 males, 10 females), with a mean age of 26.3 months (range 11–65 months), mean weight of 29.35 kg (16.3–47.9 kg) were used. Gender was equally distributed between groups. The study was conducted while dogs underwent a routine castration or ovariectomy under GA. All dogs were classified as ASA I (healthy dogs without recognizable signs of disease) according to the American Society of Anesthesiologists. An informed client consent was obtained before the dogs entered the study. Dogs were randomly assigned to Fur (4 mg/kg IV) or placebo (Con) (0.9% saline solution at a volume corresponding to the Fur treatment IV) treatment. Dogs were premedicated with morphine (0.3 mg kg−1 SQ; Morfin Alkaloid, Alkaloid Skopje, FYROM). An intravenous catheter (BD Venflon, Becton Dickinson Infusion Therapy AB, Helsingborg, Sweden) was inserted into the left or right cephalic vein. Anesthesia was induced with midazolam (0.1 mg kg−1 IV; Midazolam Torrex, Chiesi -Pharmaceuticals GmbH, Austria), followed by propofol (3–4 mg kg−1 IV; Norofol, Norbrook Laboratories Limited, Northern Ireland). After endotracheal intubation, anesthesia was maintained with sevoflurane (Sevorane, AbbVie, Campoverdedi Aprilia, Italy) delivered in oxygen using a circle breathing system. Dogs were kept in dorsal position throughout the experiment to reduce variations in the distribution of blood flow and ventilation in the lung (Galvin et al., 2007). The electrocardiogram, end-tidal CO2 tension, and arterial oxygen saturation were monitored during anesthesia (BLT M9000 VET). Lactated Ringer's solution (5 mL kg−1 h−1 IV; B. Braun, Germany) was infused during the experiment. A Swan-Ganz catheter (Baxter Healthcare Corp., Irvine, CA, USA) was placed via the left or right jugular vein into the pulmonary artery for mixed venous blood sampling, pulmonary artery pressure (PAP) and core body temperature measurement. Correct catheter placement was ascertained by observing characteristic pressure waveforms (HP Model 66S, Hewlett-Packard Company, Palo Alto, Calif.). Cardiac output was measured by the thermodilution technique (10 mL of 0.9% NaCl; injectate temperature, 23 to 25°C). Injectate volume and temperature were used according to the manufacturer's instructions (HP Component monitoring system anesthesia/standard; Ganz et al., 1971; Nemec et al., 2003). Baseline (BL) arterial and mixed venous blood were sampled simultaneously just before treatment with Fur or Con and at 15, 30, and 45 min post-treatment. Surgery (castration/ovariectomy) then commenced within few min after the 45 min sample was taken. Blood samples were collected into lithium-heparinized syringes (Gaslyte, arterial blood sampler, Vital Signs, Inc., Englewood, CO, USA) and analyzed immediately in duplicates with the Rapid Point 500 analyzer (Siemens Healthcare, Erlangen, Germany). Rapid Point 500 uses ion selective electrode method (potentiometry) for the determination of electrolyte activity, including PCO2 (potentiometry based on Severinghaus). It uses amperometric oxygen electrode for PO2. Total hemoglobin (Hb) is determined by multiwavelength spectrophotometry. The analyzer automatically calibrates sensors several times a day. Intra-and inter- assay coefficients of variation for Rapid Point 500 have coefficients of determination (CV) higher than 0.91 (Nicolas et al., 2013), whereas for variables included in this study coefficients of determination was higher than 0.96. Hematocrit (Hct) was measured using microhematocrit method (CV = 0.96). Total plasma protein (PP) was measured using a clinical refractometer (Attago 331; Attago, Tokyo, Japan) (CV = 0.92). For whole blood [Na+], [K+], and [Cl−] determination, blood samples were repeatedly frozen (−80°C) and thawed (room temperature) to induce red cell lysis. for erythrocyte fluid fluxes (JER) where [Hbv] is Hb concentration in venous, [Hba] Hb concentration in arterial blood, (Hctv) is Hct in venous and (Hcta) Hct concentration in arterial blood. Erythrocyte ion concentrations (ER[Ion]) were calculated from whole blood (WB) and plasma (PL) ion concentration according to Buono and Yeager (1986) and McKelvie et al. (1991). This was randomized double blind placebo controlled study. Mean and standard error (±SE) are reported for each variable. The data were analyzed with the random intercept mixed model. The preplanned differences were carried out with the contrast analysis, where P-values of the non-orthogonal contrasts were corrected with the Benjamini–Hocberg method for multiple comparisons. A P-value smaller than 0.05 was considered statistically significant. The computations were performed with R language for statistical computing (R version 3.0.3) (R Core Team, 2014). All dogs were successfully recovered form anesthesia. No complications related to castration or ovariectomy were reported, nor were there any post-procedures adverse effect reported 6 months after the procedure. Cardiac output did not change with the duration of GA (time), nor was there a significant effect of Fur (BL: 3.3 ± 0.4 L/min in Con, 3.8 ± 0.3 L/min in Fur; 45 min: 3.3 ± 0.4 L/min in Con and 3.6 ± 0.5 L/min in Fur) (P = 0.5) (Figure 1A). Baseline PAP was 15.5 ± 1.5 L/mmHg and 16.0 ± 0.8 mmHg in Con and Fur, respectively. There was only a slight increase in PAP from baseline to 45 min in Con and Fur (P = 0.07) (45 min: 17.5 ± 1.4 mmHg in Con and 16.5 ± 1.0 mmHg in Fur) (Figure 1B). Figure 1. (A) Cardiac output (Q) and (B) mean pulmonary artery pressure (PAP) at Baseline (BL) and at 15, 30, and 45 min of general anesthesia. Values are means ± SE. No effect of time on Hctv, Hcta, Hbv, Hba, PPv, and PPa was observed in Con, whereas Hctv, Hcta, PPv, and PPa, but not Hbv and Hba, increased significantly in Fur (P < 0.001) (Table 1). Table 1. Respiratory changes across the lung, hemoglobin (Hb), Hematocrit (Hct), and Plasma protein (PP). Arterial (PaO2) and venous (PvO2) blood O2 tensions were not affected by time or Fur. Similarly, arterial (PaCO2) and venous (PvCO2) blood CO2 tensions were not affected by time or Fur. Veno-arterial O2 difference (ΔCVAO2) increased with time in Fur (P = 0.001) from 3.4 ± 0.3 mmHg at BL to 4.1 ± 0.3 mmHg at 45 min. 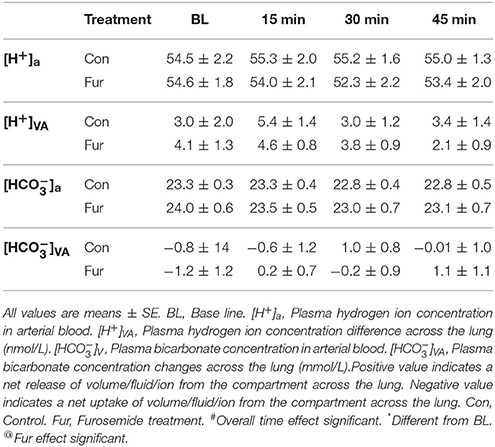 Veno-arterial CO2 difference (ΔCVACO2) was not affected by time or Fur (P = 0.9) (Table 1). Baseline ΔEV was 0.6 ± 0.4% and 1.7 ± 0.7% in Con and Fur, respectively (P = 0.2), indicating a decrease in EV across the lung. Erythrocyte volume across the lung did not change with time (P = 0.9), and was not affected by Fur (P = 0.8). Baseline JER was 10.0 ± 6.0 and 25.0 ± 9.0 mL/min in Con and Fur, respectively (P = 0.1). In Con JER remained unchanged throughout the experiment, whereas in Fur at 15 min JER declined to 10.0 ± 3.0 mL/min (P = 0.03), and then returned to BL value (Table 2). Table 2. Volume and fluid changes across the lung. Baseline ΔBV were 0.7 ± 0.5% and 1.4 ± 1.5% in Con and Fur, respectively (P = 0.6), indicating a decrease in BV across the lung. 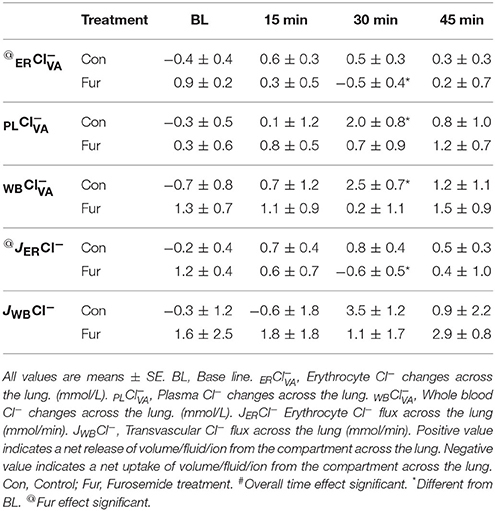 Blood volume changes across the lung were not affected by time (P = 0.5) or Fur (P = 0.8). Baseline JVA was 3.0 ± 9.0 and 19.0 ± 21.0 mL/min in Con and Fur, respectively (P = 0.5). 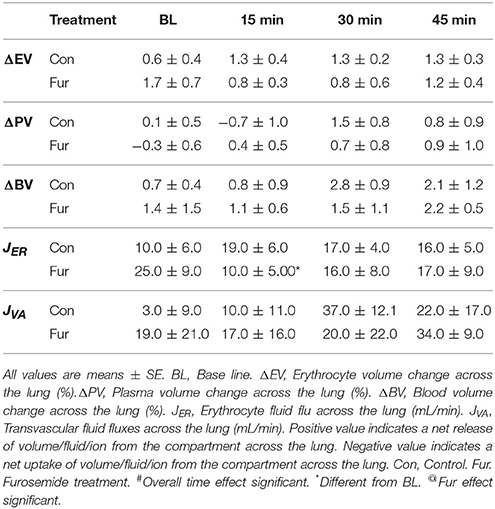 Transvascular fluid fluxes remained unchanged over time (P = 0.4) and were not affected by Fur (P = 0.8) (Table 2). 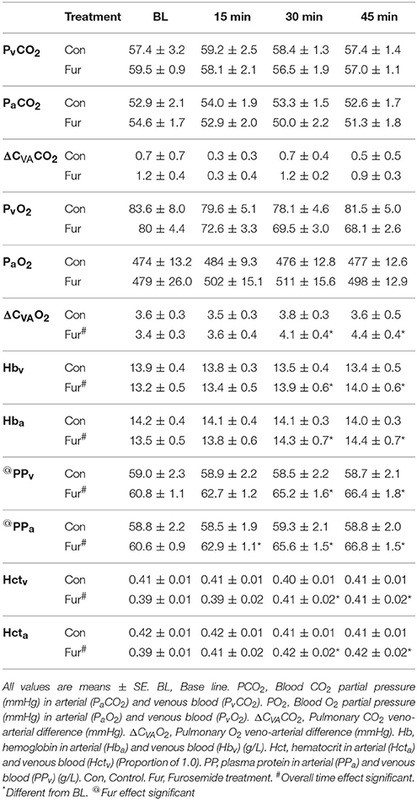 Plasma [H+] and [HCO3-] changes across the lung were not affected by time or Fur (P ≤ 0.1) (Table 3). Table 3. [H+] and [HCO3-] changes across the lung. Baseline ERNaVA+ was −0.7 ± 0.3 mmol/L and −0.2 ± 0.3 mmol/L in Con and Fur, respectively (P = 0.4), indicating no or minimal increase in ERNa+. Throughout the experiment ERNa+ remained at BL levels in Con (45 min: −0.4 ± 0.7 mmol/L) and Fur (45 min:−0.6 ± 0.3 mmol/L), and was not affected by time (P = 0.8) or Fur (P = 0.9). Some increase in ERNa+ was evident in Fur at 30min (−1.2 ± 0.3 mmol/L); however, this value remained non-significant (P = 0.08). Baseline PLNaVA+ was −0.7 ± 0.6 mmol/L and −0.9 ± 0.7 mmol/L in Con and Fur (P = 0.9), respectively, indicating a modest increase in PLNa+ across the lung. Throughout the experiment PLNa+ remained at BL level. Baseline WBNaVA+ was −1.5 ± 1.4 and −1.1 ± 0.9 mmol/L in Con and Fur, respectively (P = 0.9). Throughout the experiment WBNa+ continue to show a weak tendency to move into the vascular compartment in Con and Fur. Effects of time (P = 0.3) or Fur (P = 0.9) were not evident (Table 4). Table 4. Sodium (Na+) changes across the lung. Baseline JERNa+ was −0.9 ± 0.5 mmol/min and −0.2 ± 0.4 mmol/min in Con and Fur. Sodium erythrocyte fluxes remained unchanged over time in Con (45 min: 0.8 ± 0.4 mmol/min). In Fur with time ERNa+ influx increased to 1.6 ± 0.3 mmol/min at 30 min (P = 0.08), but then returned to BL vales at −0.7 ± 0.6 mmol/min at 45 min. Baseline JWBNa+ was −2.8 ± 1.6 mmol/min and −2.4 ± 1.8 mmol/min in Con and Fur (P = 0.9), respectively. Time (P = 0.4) and Fur (0.09) had no effect on JWBNa+ (Table 4). Baseline ERKVA+ was −0.3 ± 0.2 and 0.4 ± 0.2 mmol/L in Con and Fur, respectively (P = 0.3). Time did not affect ERKVA+ in Con (P = 0.9), whereas in Fur ERK+ started to increase at 30 min (P = 0.03) and the returned to BL value at 45 min. Baseline PLKVA+ was −0.2 ±0.6 and −0.2 ±0.8 mmol/L in Con and Fur, respectively (P = 1.0). Although PLKVA+ started to decrease within plasma compartment with time in Con and Fur, this effect was not found to be significant (P = 0.3). Baseline WBKVA+ was −0.9 ±0.6 and −0.4 ±0.7 mmol/L in Con and Fur, respectively (P = 0.9). 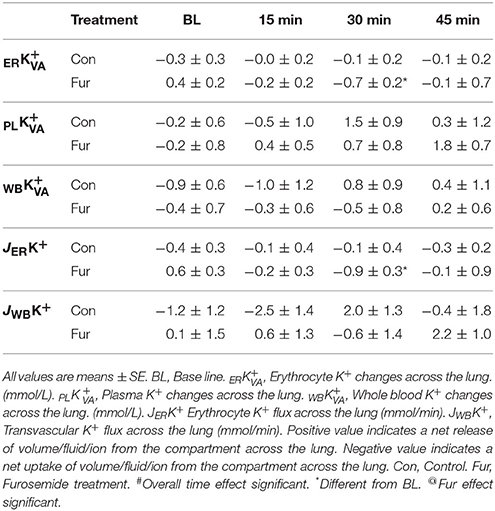 Time (P = 0.5) and Fur (P = 0.9) did not affect WBKVA+ (Table 5). Table 5. Potassium (K+) changes across the lung. Baseline JERK+ was −0.4 ±0.3 mmol/min and 0.6 ±0.3 mmol/min in Con and Fur (P = 0.3), respectively. Potassium erythrocyte flux remained unchanged over time (P = 0.6) and was not affected by Fur (45 min: −0.3 ± 0.2 mmol/min in Con and −0.1 ± 0.9 mmol/min in Fur) (P = 0.9). Baseline JWBK+ was −1.2 ± 1.2 and 0.1 ±1.5 mmol/min in Con and Fur (P = 0.6), respectively. Potassium transvascular flux remained unchanged over time (P = 0.3) and was not affected by Fur (P = 0.3) (Table 5). Baseline ERClVA- was −0.4 ± 0.4 and 0.9 ± 0.3 mmol/L in Con and Fur, respectively (P = 0.7). Throughout the experiment ERCl− remained within BL values in Con (P = 0.8). In Fur at 30 min ERCl− efflux reversed to influx at −0.5 ± 0.4 mmol/L (P = 0.02). Overall effect of Fur was significant at P = 0.04. Baseline PLClVA- was −0.3 ± 0.5 and 0.3 ± 0.6 mmol/L in Con and Fur, respectively (P = 0.9). 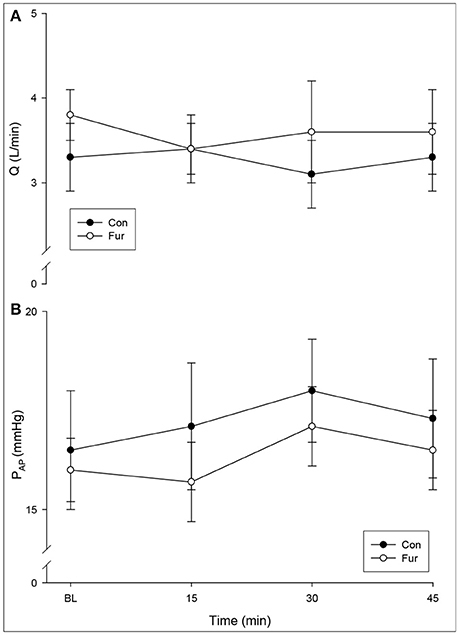 In Con PLCl− efflux increased to 2.0 ± 0.8 mmol/L (P = 0.04) and returned o BL value by 45 min. Similar was not evident in Fur (P = 0.7). Baseline WBClVA- was −0.7 ±0.8 and 1.3 ±0.7 mmol/L in Con and Fur, respectively (P = 0.2). With time WBCl− showed a weak tendency to efflux from the vascular compartment, which was most prominent at 30 min in Con (2.6 ± 0.7 mmol/L; P = 0.02). Similar was not evident in Fur (P = 0.7) (Table 6). Table 6. Chloride (Cl−) changes across the lung. Baseline JERCl− was −0.02 ± 0.4 mmol/min and 1.2 ± 0.4 mmol/min in Con and Fur (P = 0.1), respectively. Chloride erythrocyte flux did not change with time in Con, whereas in Fur at 30 min it changed to influx at 0.6 ± 0.4 mmol/min (P = 0.02). The overall effect of Fur on JERCl− was significant at P = 0.05. Baseline JWBCl− was −0.3 ± 1.2 and 1.6 ± 2.5 mmol/min in Con and Fur (P = 0.4), respectively. In general, Cl− showed the tendency to flux out of the vascular compartment throughout the experiment. In Con at 30 min JWBCl− was significantly different from BL (P = 0.04). No overall effect of Fur on JERCl− was observed (P = 0.6) (Table 6). This is the first report of fluid and ion fluxes across the pulmonary circulation during GA. In the present study we observed erythrocyte and blood volume changes across the lung (~1.0–1.5%), which are in line with those reported from horses at rest (Vengust et al., 2006a,b, 2011, 2013). Volume changes created JVAof ~20 mL/min. Dogs were treated with Fur to reduce hydrostatic forces and/or influence erythrocyte and transvascular ion metabolism (Mukherjee et al., 1981; Narins and Chusid, 1986; Boles Ponto and Schoenwald, 1990). 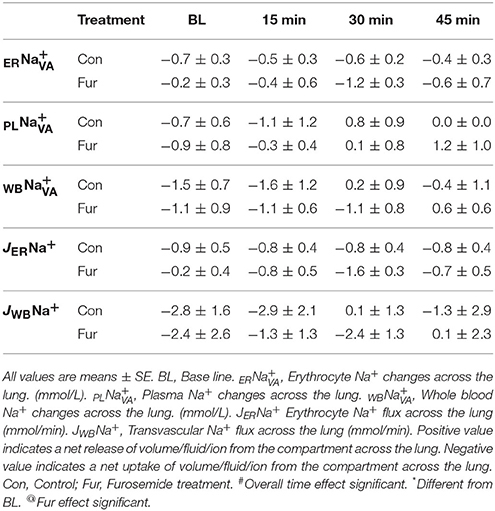 Treatment with Fur caused dehydration and partially affected Cl− metabolism across pulmonary vascular compartments; however, it did not change Q, PAP, and/or JVA. Our hypothesis was, therefore, verified. Furosemide is used in patients with pulmonary edema. The reduction in lung water is due to a decrease in preload through venodilatation and diuresis (Dikshit et al., 1973), which decreases transmural hydrostatic pressures (Bake et al., 1968; Hlastala et al., 1996). Furosemide treatment in this study dehydrated dogs and caused volume depletion due to diuresis (Dikshit et al., 1973), which was not translated into reduced Q, PPA, and JVA. Transvascular fluid fluxes, however, were also not affected in previous studies where a significant decrease in Q due to Fur was reported (Wickerts et al., 1992; Vengust et al., 2011). General anesthesia can cause some degree of ventilation perfusion (V/Q) mismatch (Gunnarsson et al., 1991), which is mitigated by a variable degree of HPV (Dueck et al., 1984). The most consistent triggering factor is the decrease in lung compliance and a fall in functional residual capacity (Mead and Collier, 1959; Bendixen et al., 1963). HPV optimizes systemic O2 delivery by constricting and increasing pressure in pulmonary microcirculation away from hypoxic lung regions (Madden et al., 1992). Increased pulmonary microvascular pressures change the balance between intra- and extravascular Starling forces and may influence JVA (Starling, 1896; Vengust et al., 2013). In normal lungs, however, it is unlikely that the level of alveolar hypoxia during GA using normal concentration of volatile anesthetics would create edemagenic PAP and clinical edema (Domino et al., 1986; Marshall et al., 1991). In the present study a steady but non-significant increase in JVAwas observed within 45 min of GA on Con and Fur. This was equal in Con and Fur and, therefore, cannot be attributed to fluid therapy because of the diuretic effect of Fur (Mitchell et al., 1992). It is most likely that the supine (dorsal) position during GA was the reason for modest increase in JVA (Wiener et al., 1990). Opioid drugs, benzodiazepines and propofol used for premedication and induction of GA in this study do not affect pulmonary vascular reactivity, and are not considered a significant initiator for V/Q mismatch (Gibbs and Johnson, 1978; Benumof et al., 1987; Reves et al., 2010). Sevoflurane and other modern inhaled anesthetic on the other hand have a moderate inhibitory effect on HPV (Marshall et al., 1984; Wang et al., 1998; Kerbaul et al., 2006) and may even cause a reduction in JVA. Because sevoflurane in this study was delivered in O2, some degree of atelectasis would theoretically be expected (Sylvester et al., 2012). However, studies in animals and humans failed to generate significant O2 related shunt during GA (Wagner et al., 1974; Dantzker et al., 1975; Lundquist et al., 1988; Sylvester et al., 2012). In the present study Cl− metabolism was the most affected by Fur, which coincided with the reduction of JER but did not influence JVA. Transvascular fluid fluxes in healthy individuals seem to be dependent on ΔEV (Vengust et al., 2006a, 2011, 2013). Erythrocytes have a complex and specific regulation of their volume through changes in their osmolality (van't Hoff, 1887; Hamburger, 1891, 1918). In peripheral tissues in deoxygenated blood, Cl− (and water) is exchanged for HCO3- across the erythrocyte plasma membrane (Hamburger, 1891, 1918; Bretcher, 1971). Na+/K+/2Cl− cotransport across the erythrocyte plasma membrane is activated by similar stimuli and contributes to solute concentration in the erythrocyte. Erythrocyte osmolality persists at rather higher levels also due to lower PO2 in peripheral tissues, which inhibits K+/Cl− cotransport/egress from erythrocytes. On contrary, the Na+/K+ ATPase activity across the erythrocyte plasma membrane decreases erythrocyte [Na+] and consequently erythrocyte osmolality. Na+/K+ ATPase effect, however, is inferior to combined activity of other ion channels, which work toward the increase of intracellular osmolality and EV. In the lung capillary bed increased PO2, efflux of Cl−, decreased [H+], and active K+/Cl− cotransport across the erythrocyte plasma membrane reverse the process to erythrocyte regulatory volume decrease and fluid egress from erythrocytes (Fievet et al., 1990; Gibson et al., 1993, 1994, 2000; Honess et al., 1996; Speake et al., 1997; Juel et al., 1999). Previous studies in horses demonstrated, that JVA is mostly dependent upon the Jacobs-Stewart cycle (Vengust et al., 2013), which is a cycle of intracellular-extracellular exchanges involving CO2, HCO3-, Cl−, and H+ across the erythrocyte membrane during capillary transit that speeds and enhances CO2 elimination (Jacobs and Stewart, 1942). As erythrocytes traverse the pulmonary microvasculature their membranes come into close contact with the capillary endothelium to form a functional single semi-permeable barrier. This semi-permeable “membrane” has the osmotic characteristics of the erythrocyte membrane itself (Hansen, 1961), and so may permit ionJVA and JVA (Vengust et al., 2013). Increase in ERK+, and near significant increase of ERNa+ at 30 min indicated that Na+/K+/2Cl− cotransport was affected by Fur. These changes were only detected across the erythrocyte membrane at 30 min of GA, which is consistent with furosemide pharmacokinetics in dogs (Hirai et al., 1992). However, changes in Cl− metabolism across the lung were evident throughout the vascular compartment and not only across the erythrocyte membrane. These changes are not exclusive to Na+/K+/2Cl− cotransport inhibition and should also be attributed to the Jacobs-Stewart cycle. Because Na+/K+/2Cl− cotransport is also important at the vascular endothelial level where it contributes to the integrity of the permeability barrier (O'Donnell, 1993), the Jacobs-Stewart cycle assumed a transvascular role in maintaining the volume and ion equilibrium after Fur treatment. It would also be possible that Fur influences JVA through other effects not directly related to diuresis. Furosemide causes direct pulmonary vasodilatation and improved pulmonary compliance, which should reduce the risk for JVA (Lundergan et al., 1988; Silke, 1993; Greenberg et al., 1994) Hemodynamic properties of Fur are beneficial in patients with mild physical impairments due to ventricular dysfunction, whereas it seems that in healthy subjects are unlikely to show any quantifiable effect (Silke, 1993). Furosemide also induces a weak bronchodilator effect when inhaled in asthmatic humans (Bianco et al., 1988) or given intravenously to horses with (Rubie et al., 1993) or without the pulmonary obstructive disease (Olsen et al., 1992). Bronchodilation reduces the effect of exercise induced alveolar hypoxia and consequent pulmonary vasoconstriction of small pulmonary arteries, which increases pulmonary microvascular pressure and affects pulmonary capillary water permeability (Mairbäurl et al., 2002). The combination of Fur effect related to volume depletion, pulmonary vasodilatation and bronchodilation most probably contributed to better ΔCVAO2 in Fur in this study. Changes in [H+] can influence vascular tone by regulating endothelium and vascular smooth muscle function (Aalkjaer, 1990). No acid base imbalance was noted in dogs in this study, which could potentially affect JVA. Alkalosis is consistently associated with the reduction in pulmonary microvascular pressures (Loeppky et al., 1985). Effects of acidosis, however, on pulmonary circulation vascular resistance is inconsistent. Pulmonary vasculature in general, unlike systemic circulation, shows resistance to vasodilator effect of extracellular acidosis (Aalkjaer, 1990; Barnes and Liu, 1995). Extracellular acidosis has also been shown to increase PVR in isolated dogs' pulmonary lobes, and calves and children with congenital heart disease and associated pulmonary hypertension (Lloyd, 1966; Rudolph and Yuan, 1966; Morray et al., 1988). Increase in pulmonary smooth muscle intracellular [H+], however, decreases PVR in isolated animal lungs (Raffestin and McMurtry, 1987; Ketabchi et al., 2009). The experimental methodology used in the present study has previously been validated (Costill et al., 1974; Dill and Costill, 1974; Vengust et al., 2006a, 2011, 2013). Variables measured are reproducible, have excellent CV and are able to detect small changes across different compartments. It is important to realize that methodology used herein enables an “in-vivo” investigation of lung fluid physiology. In contrast, lung lymph flow or pulmonary gravimetric techniques, two other methods to study lung fluid physiology, are more invasive, require post mortem examination, and/or require static investigation employing nuclear medicine. Lung lymph flow studies would also require better defined attention to the uncertainty concerning the tissues drained by the lymphatics and the effect of the lymph nodes themselves on lymph constituents (Coates et al., 1984; Newman et al., 1988). Gravimetric lung fluid dynamic studies only detect variations in the presence of lung water and are unable to account for alterations when changes are to be contributed to the vascular, interstitial, and/or cellular compartments in lungs (Lin et al., 1998; Hanel et al., 2003). Most dog breeds have a very low Na+/K+ ATPase activity with consequent high erythrocyte Na+ and low erythrocyte K+ concentrations (Maede and Inaba, 1985). The importance of Na+/K+ ATPase activity with regards to JVA is minimal, as discussed above. Reduced Na+/K+ ATPase causes erythrocyte Na+ and K+ concentrations to be similar to those in plasma, making intra-erythrocyte ion analyses in dogs less prone to an analytical error arising from high or low intracellular ion concentrations present in other species. This study does not provide evidence and comparison between awake and anesthetized dogs. However, it is relevant to assume that JVA in an awake dog is similar to BL values in this study (Wickerts et al., 1992; Vengust et al., 2006a). It is ethically unacceptable to instrument awake dogs in a manner such as used in this study, and physical restraint would cause a variety of stress related physiological changes. The dynamics of water movement in the pulmonary circulation are complex events encompassing Starling forces, gas exchange mechanisms, and EV regulation. Adaptations in ion metabolism in this study complimented the very low hydraulic conductance of the lung microvasculature, and prevented changes in JVA. The Jacobs Stewart cycle also seems to be an important safety factor for the stability of lung fluid dynamics. Differences in JVA should be expected when alveolar epithelial and endothelial permeability are compromised due to e.g., mechanical ventilation and/or inflammation. Lung microvascular and alveolar permeability to proteins would then alter Starling forces and EV regulation and cause more prominent and abnormal lung fluid redistribution. MV, GH, and RB: participated in research design; OF, AD, AS, and MV: conducted experiments; OF, RB, GH, MV: performed data analysis. All authors wrote/contributed to the writing of the manuscript. This study was supported by the Slovenian Research Agency grant P4-0053 and the Canadian Institutes of Health Research. We thank Mitja Miklavcic, DVM, and Jerneja Sredensek, DVM for their assistance during general anesthesia. Fur, Furosemide treatment; VA, Veno-arterial difference across the lung; JVA, Transvascular fluid fluxes in the pulmonary circulation; PPA, Pulmonary artery pressure; ionJVA, Transmembrane/transvascular ion fluxes; BL, Baseline; EV, Erythrocyte volume; PV, Plasma volume; JPL, Plasma fluid fluxes; JER, Erythrocyte fluid fluxes; ER[Ion], Erythrocyte ion concentrations; WB[Ion], Whole blood concentrations; JERIon, Erythrocyte ion fluxes across the lung; JWBIon, Whole blood fluxes across the lung; SID, Strong ion difference. Barnes, P. J., and Liu, S. F. (1995). Regulation of pulmonary vascular tone. Pharmacol. Rev. 47, 87–131. Greenberg, S., McGowan, C., Xie, J., and Summer, W. R. (1994). Selective pulmonary and venous smooth muscle relaxation by furosemide: a comparison with morphine. J. Pharmacol. Exp. Ther. 270, 1077–1085. Hamburger, H. (1891). Uber der einfluss der athmung auf die permeabilitit der blutkörperchen. Biochem. Z. 28:405. Hamburger, H. (1918). Anionenwanderungen in Serum und Blut unter dem Einfluss von CO2, Saure und Akali. Biochem. Z. 86, 309–324. Loeppky, J. A., Scotto, P., Riedel, C. E., Roach, R. C., and Chick, T. W. (1985). Effects of acid-base status on acute hypoxic pulmonary vasoconstriction and gas exchange. J. Appl. Physiol. 72, 1787–1797. Lundergan, C. F., Fitzpatrick, T. M., Rose, J. C., Ramwell, P. W., and Kot, P. A. (1988). Effect of cyclooxygenase inhibition on the pulmonary vasodilator response to furosemide. J. Pharmacol. Exp. Ther. 246, 102–106. Maede, Y., and Inaba, M. (1985). (Na,K)-ATPase and ouabain binding in reticulocytes from dogs with high K and low K erythrocytes and their changes during maturation. J. Biol. Chem. 260, 3337–3343. Olsen, S. C., Coyne, C. P., Lowe, B. S., Pelletier, N., Raub, E. M., and Erickson, H. H. (1992). Influence of furosemide on hemodynamic responses during exercise in horses. Am. J. Vet. Res. 53, 742–747. Reves, J. G., Glass, P. S., Lubarsky, D. A., McEvoy, M. D., and Martinez-Ruiz, R. (2010). “Intravenous anaesthesia,” in Miller's Anaesthesia, 7th Edn, ed R. D. Miller (Philedelphia,PA: Churchill Livingstone), 728–729. van't Hoff, J. H. (1887). Die rolle osmotischen drucks in der analogie zwischen losungen und gasen. Z. Phys. Chem. 1, 481–508. Copyright © 2018 Frlic, Seliškar, Domanjko Petrič, Blagus, Heigenhauser and Vengust. This is an open-access article distributed under the terms of the Creative Commons Attribution License (CC BY). The use, distribution or reproduction in other forums is permitted, provided the original author(s) and the copyright owner are credited and that the original publication in this journal is cited, in accordance with accepted academic practice. No use, distribution or reproduction is permitted which does not comply with these terms.